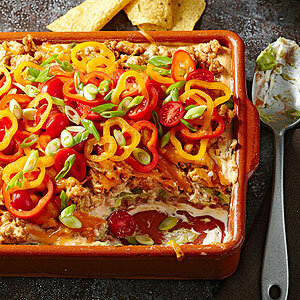 Ground turkey, reduced-sodium and light ingredients, and a confetti of crisp, colorful veggies make this potluck staple more nutritious than a typical layered dip--but every bit as tasty. In a large nonstick skillet, combine ground turkey, jalapeno (if using) and 2 tablespoons of the taco seasoning mix. Cook over medium heat until turkey is no longer pink; remove from heat and set aside. Meanwhile, spread cream cheese into the bottom of a 13x9x2-inch baking dish. Spread refried beans over cream cheese. Stir the lemon juice into the mashed avocado and spread over refried beans. In a small bowl, stir together sour cream, mayonnaise and remaining taco seasoning mix. Spread sour cream mixture on top of the avocado layer. Top with ground turkey mixture, then sprinkle top with cheddar cheese. Bake, uncovered, in a 325 degrees oven about 25 minutes or until heated through and cheese is melted. Top with green onion, tomatoes and sliced peppers. Serve with baked tortilla chips.